The specially designed lug-bolt adapters balance wheels far more accurately than a cone used by itself, resulting in a smooth, vibration-free drive. Includes flange plate kit and measuring caliper. 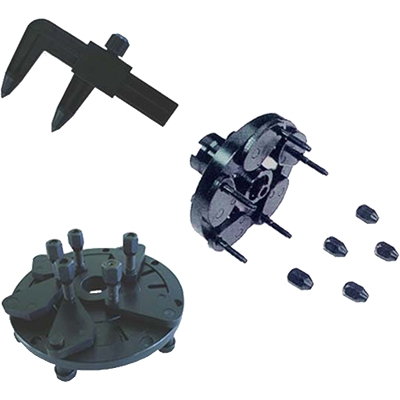 Essential for the more precise wheel balancing, this plate kit comes with 5 centring pin adapters to fit most cars and light trucks, imported and domestic. The specially designed lug bolt adaptors balance wheels far more accurately than a cone by itself. The result is a smooth, vibration-free drive for you and your clients. Includes flange plate kit and measuring caliper.